A good friend of mine loaned his Woo Audio 6 to me during his time away for a business trip. 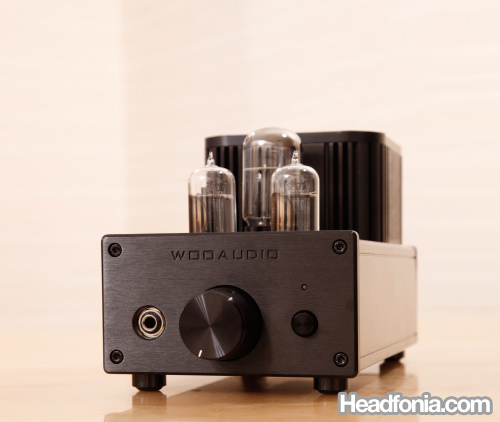 The Woo Audio 6 is the entry level model of WooAudio’s transformer coupled tube amplifiers. It sells for $585 in stock configuration, but this one has the PDPS power supply upgrade that costs an additional $60. Another popular upgrade offered by Woo Audio 6 is the Sophia Princess rectifier tube, though this unit does not have it. WooAudio has one of the prettiest and slickest build quality that you can find in the industry. Everything from the hairline finishing, the lines, the knobs, the transformer housing, all the way to the back panel, you find nothing but top quality workmanship. This amplifier will definitely give other amplifiers body image issues. I even have a feeling that the screws don’t come like that from the supplier, but rather, Woo painted them glossy black for that extra perfect touch. Everything inside the Woo6, like all other WooAudio amplifiers, is wired point to point for superior sound quality over regular PCBs. It feels very solid too. The thick front plate, the transformer housing, and the two transformers inside all contribute to a total weight of over 6.5 kilograms. 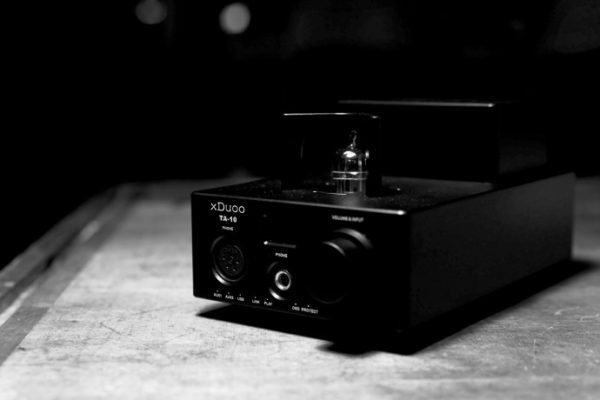 No one will mistake the WooAudio6 for a cheap amplifier. 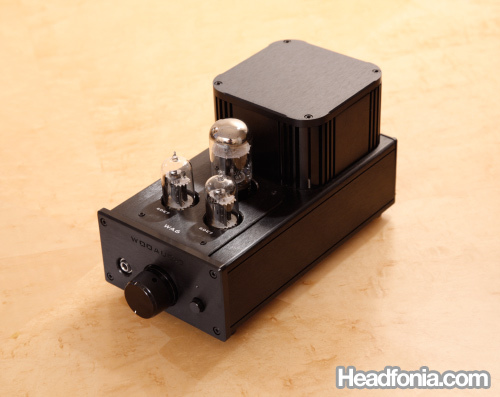 Sometimes I wish that Cary amplifiers are build like this. When I first heard the amplifier, it has only under 50 hours of playtime, and the sound is still a little rough. This time, it has over 200 hours and the roughness is no longer there. The sound is very smooth without ironing out any details. What I like about the WooAudio6 is that it gives you a nice warm sound, without going too mellow. If your music needs punch and impact, the Woo6 will give it to you any day of the week. The Woo6 has an addictive thick sound and it really stands out beautifully among my Grace M902 and Beta22. Even as I’m writing this, listening to the wonderful HD800 and Grace M902 combo, that thick WooAudio6 sound keeps on calling me. If I have to give a three words summary of the WooAudio6, it’ll be: smooth, thick, and impactful. The WooAudio6 is one of my favorite amplifiers. Somehow it was able to get a great synergy with two headphones with almost an opposite character: both the Sennheiser HD650 and the Grado HF2. If you listen to a lot of Jazz, RnB, Pop, and Vocal, you’ll definitely love the WooAudio6. 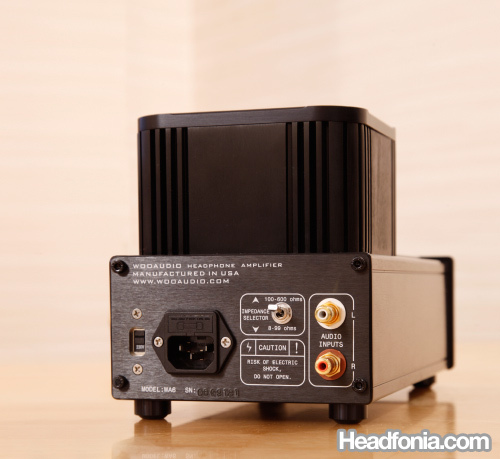 Yes, it’s a superb amplifier, but shipping cost and customs tax is not going to be small. What a pity. Very interesting. The synergy with low-impedance HF2 makes it really a tempting choice! I spent a month exclusively with the HD650 and when I switched to my HF2's again I couldn't believe how much better it was. Both were used balanced. The HF2 sounds open, clear, dynamic and punchy. The HD650 sounds closed in, muffled, lethargic and bloated. Yes the HD650 is smoother and has a better soundstage, but it baffles me that anyone can consider it some kind of a reference … maybe a reference on mediocrity. They are both dark though, it's no big surprise that an amplifier is a tonal match for both. Thanks, Eugen. Many people, me included, actually think that the HD650 is one of the finest headphones around, but everyone is entitled to his own opinion. The HF2 has a nice coloration, and though it's nice to listen to, it's not the sort of headphone that you can make a reference. Sorry but im a bit confused. You said that you love the HD650 with the WA6 but you prefer it more with the HD-160D(S) but think it should used with a tube amp and i think you said balanced too. Q: What do I amp with the hd650? I don’t think you absolutely have to narrow down the choice to just one amp. And the idea that the HD650 will perform at its best with that particular one amp, and no other amplifier can come close to it is not entirely true. Every amplifiers have their own plus and minuses. You can pair the HD650 from anything with a Schiit Asgard, Valhalla, Graham Slee Solo, Burson HA-160, Woo Audio WA6, WA5, Balanced or Single ended, there a lot of choice out there. I have a question regarding the WA6 and the WA6SE. I know that you have no listened to (or atleast havent reviewed) the WA6SE so I guess you cant comment on sonic differences, price-to-performance ratio, etc but i was wondering if you could explain what some of the differences are and also what is Pseudo-dual power supply which is now standard on both. I guess what im trying to ask is why would I get one over the other assuming that the WA6SE is a overall “better” WA6. All I know is that the WA6SE has the same amplifier section but an upgraded power supply. With tube amps, power supply is very important, and I’m pretty sure that the WA6SE will be a clear improvement sonic wise over the WA6. Now, regarding the power output, I’m not sure if that’ll give the WA6SE a higher current level than the WA6 since that may be limited by the design of the amplifier section. The big giant tube is the rectifier which affects power supply quality. The two small tubes on the front actually affects the final sound signature more. I’ve tried it with two different tubes but gosh I can’t remember what they are. this might be a bit out of topic, i compared the solo srg ii and the wa 6 yesterday (the one at jaben jakarta,if i’m not mistaken, it’s franky’s), and the wa6 of course is better, by at least 2 points or 3, my question is how does the ultra linear compared to that? I wouldn’t say that the WA6 is better, perhaps it just strikes your ears closer to the sound you’re looking for. There are areas that the Graham Slee do better than the Woo. The ultra linear adds more treble to the Graham Slee Solo SRG II’s sound. What is the different between this and the special edition WA6 SE? Tube in overall is not suitable for rock and bass heavy music right? Supposedly the SE version has a higher power output, but when I tried the SE I was only using the HD800 (300 Ohms, doesn’t need that much power), so I really can’t say if it was indeed more powerful. Overall the sound can be said to be almost identical to the non-SE. There were some differences here and there, tiny differences, but again the tubes were different so that’s probably the cause of it. I think the only difference that I noticed that can be attributed to the separate power supply is that the soundstage has a better depth than the non-SE. 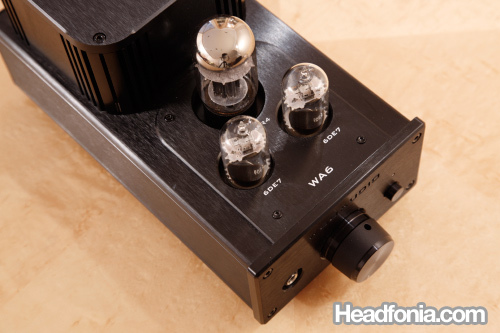 The WA6 is among the better ones when talking about bass in tube amps in general. However the tubes still need time to recharge between beats and with complex bass passages, even the WA6 can’t keep up very well. So it depends on the type of bands that you listen to, but the bottom line is rapid, complex bass passages are no good on tube amps. Blues, ballades, some classic rock, the WA6 works just nice. Hi Mike, have you tried the WA3? Is it a good entry level tube amp? How is it compared to the WA6? OTL means output transformerless, meaning there is no transformer at the output of the amplifier. Depending on the tubes used, and the design of the amp, a transformer is often needed to adjust the output impedance of the amp to something closer to the load that will be plugged in to it (a headphone in a headphone amp). 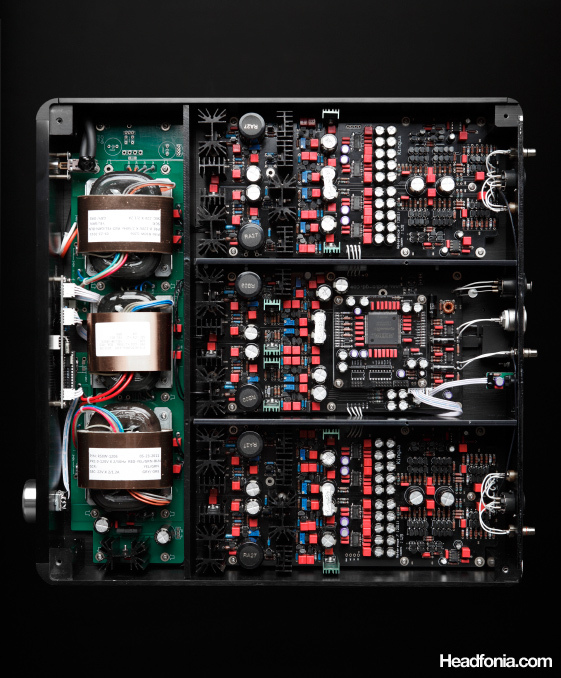 When the impedances are matched properly, the amp will be able to deliver the maximum current output it’s capable of. This is why tube amps with high current outputs often have an output transformer. On the other hand, an output transformer is essentially a very long wire, and so you’re making the signal path extremely long. This is why output transformer-less amp tend to have better resolution, better fidelity than those with output transformers. At least that’s my perspective of it. With low ohm headphones, it’s better to have an output transformer to make sure that the cans would get all the current it needs. With high impedance Senns and Beyers, OTLs are good. Mike, have you tried Little Dot from China? Their MK3 seems to be very affordable, what do you think? Yes they are good entry level amps. I’ve listened to the Mk4, but not the Mk3. Hi Mike, how would you compare this to the WA6? Are they producing good tube warm kind of sound? Yes the Mk4 is warmer than the Woo.. Good clarity, smooth, very enjoyable, just a little loose on the bass. Hi Mike, one question regarding the WA6, I’m currently using it with my LCD-2 and i found that on high volumes (2 o’clock above) the sound gets distorted. Will changing the tubes with higher output improve on how the wa6 drive my lcd-2? I really can’t say as there are so many tubes out there, but I don’t think that the Woo6 is optimized for orthos. Mike, will you get a chance to review WA7, which looks so beautiful from the pictures. Will WA6 std drive properly & optimally Hifimans & Audezes? Some says it will. But the RMS output per channel approx 500mW at different ohms. On Audeze’s site they stated optimally need 1-4Watt for it’s 70ohm impedance. Good pairing w/ my “bright” DT990 600 ohm? Will the WA6 still be a better pairing than the OTL WA3? So putting aside sound signature, as a general rule OTL will always perform better with hi impedance headphones? Just to make sure I got, from reading reviews, the WA6 seems to be a better sound signature amp than the WA3. But in the case of High Impedance headphones (600 ohms) the cheaper OTL WA3 will still out perform the WA6? So when does it get better, theWA6 SE perhaps? or is it the W2? you should compare the WA2 to the WA3 and the WA6 to the WA6SE, not eachother as they are made with different technologies. For high impedance headphones OTLs will always be better, but that doesn’t mean the other won’t sound good. Hey hi L so for HD650, WA2 or la Figaro 339 is better? Can’t find a dealer for la Figaro here in Singapore so can’t really try to compare against WA2. $730 vs $1190 I think. How do you feel HD800 with WA6, in comparison to HD650 with WA6? did you try the WA6 with a Final Audio Pandora Hope VI (8 Ohm, 105 dB/1W)? It should work well together. That should be a good match! But the FA Pandora Hope VI is now changed to the FA Sonorous VI, and I don’t know for sure that they sound the same. I also had the Pandora Hope IV, and it did not sound very good like the VI. One other thing about the very heavy Pandora VI that it also shares with the Grado PS1000e, is when it’s on your head, if you move your head any, it shakes like a big bowl full of water or jello. You have to sit very still.